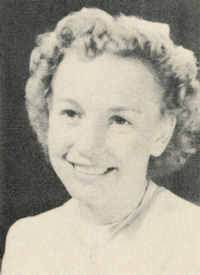 Obituary – Fischer, Margaret Maude (Murch) « Perry High School Alumni Association, Inc.
Margaret M. “Maggie” Fischer was born April 27, 1930 in Perry, Oklahoma where she was raised and educated. Maggie lived in Midland, Texas on April 20, 2009 when the angels took her home. Margaret, better known as Maggie, loved spending time with her friends, taking a trip or just having a cup of coffee with them. She loved playing bridge, going to the theatre and was a member of the “Old Timers Club”, Ladies Breakfast Club, and an active member of St. Paul United Methodist Church. Maggie married the love of her life, Peter J. Fischer, Jr. on January 26, 1951. She will be greatly missed in all aspects of our lives. Maggie’s words of wisdom, her grace and her unimaginable amount of love, will forever live on in each of her children’s hearts, her grandchildren’s hearts and her inspiration of life and of Christ’s love will be forever felt through her great-grandchildren, and their lives as she blessed them in ways that only she could. For she gave everything she had spiritually to them, and I believe God must have been really fond of her. Maggie was preceded in death by her father, Bernie Henry Murch; mother, Rita Kay Murch; and brother, Bill O. Murch. She is survived by her husband of 58 years, Peter J. Fischer, Jr.; daughter, Debra K. Tate; son, Dan W. Fischer; granddaughters, Heidi L. Taylor, Heather R. Tate, Bailey Jones, Casey Fischer; grandsons, Hunter L. Tate, Heston J. Tate; great-granddaughters, Dallas R. Blocker, Devine C. Cook, Jordin K. Taylor; brother, Don Murch; and sister in Christ, Sue Ewing. The family will receive friends at Ellis Funeral Home Tuesday, April 21, 2009 between the hours of 6:00 P.M. and 8:00 P.M. Funeral services have been scheduled for 3:00 P.M. Wednesday, April 22, 2009 at St. Paul United Methodist Church. Interment will take place 10:00 A.M. Friday, April 24, 2009 at Grace Hill Cemetery in Perry, Oklahoma. In lieu of flowers, the family requests that memorials be directed to Hospice of Midland, P.O. Box 2621, Midland, Texas 79702. Arrangements are under the direction of Ellis Funeral Home.